Acknowledgement of excellence and investment don’t necessarily go hand in hand. Personally I feel more admiration than fondness for some outstanding yet dry series, especially those that intentionally keep a distance from the viewer. It happened earlier this year with Showa Genroku Rakugo Shinju; the show lacked the animation dexterity to humanize its characters, and without that expressive acting it may have had as a stronger TV production or a movie, it was up to the framing to sell the performers as people as well. Something that worked when the direction and storyboards were at their finest – Mamoru Hatakeyama’s own episodes, and Nobukage Kimura’s #9 – but fell relatively flat otherwise. In contrast, Mob Psycho 100 never quite had those issues. ONE’s work is nothing if not a raw display of emotion, and Yuzuru Tachikawa always kept in mind that it was essential to his adaptation – understandable, since he was dealing with a series starring an awkward teenager forced to contain his emotions. Breathing life into the characters had a higher priority than delivering spectacular action, even if the latter has an easier time standing out. It’s not as if the series was without fault though, and the entire cast wasn’t equally lucky; Ritsu’s arc had the misfortune to begin at the point where the least inspired direction overlapped with the most aggressive pacing – fixed TV anime structure doing no favors to an adaptation once again – so his descent into darkness had a lesser impact than the eventual redemption. But more importantly, there was someone else. A character who seemingly stayed away from the main narrative and yet made the most of his appearances. The person that turned out to be the show’s actual heart, who stole and elevated the series in the final arc. 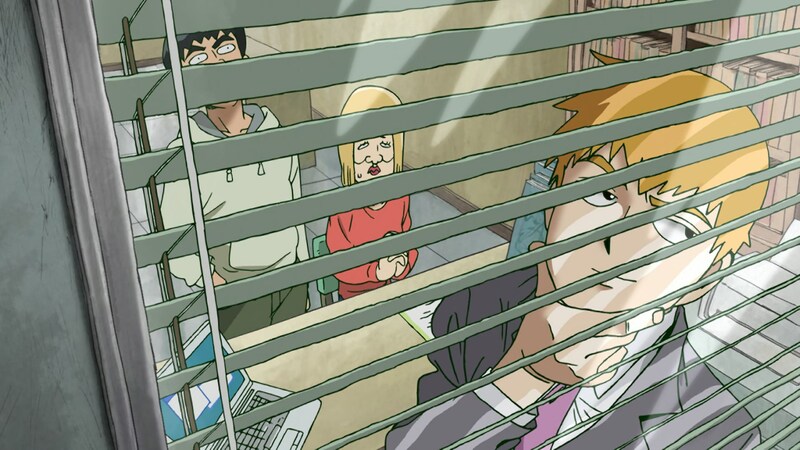 A couple days ago my colleague liborek briefly mentioned that resourceful directors must have a blast depicting characters like Reigen. Since the very beginning he’s been established as a farce, and one who isn’t good at lying to boot. A phony psychic in a world where tremendously powerful beings really do exist, yet self-proclaimed genius esper. His behavior makes this all patently obvious without requiring him to open his mouth; he dramatizes every moment of his life, oversells himself, and then lacks the composure required to make up convincing excuses. He has a tendency to dominate the frame as part of his grandiose persona, but quickly cowers when he realizes he’s in danger. 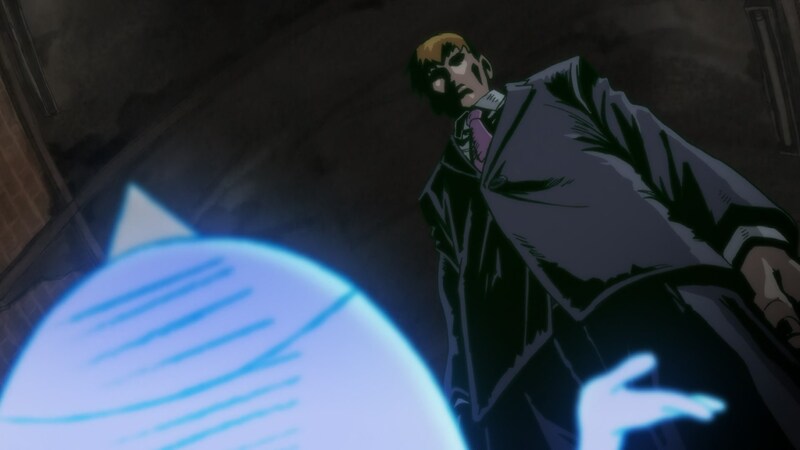 Mob Psycho toys around with visual power dynamics being reversed often – in a world where powerless humans, strong espers, and even more powerful psychics coexist, the power balance is bound to be different than what it first looks like. Miyo Sato’s paint-on-glass sequences within the show have been coded to supernatural occurrences, as Tachikawa used the contrast between their otherworldly look and regular 2D animation in an effective way. 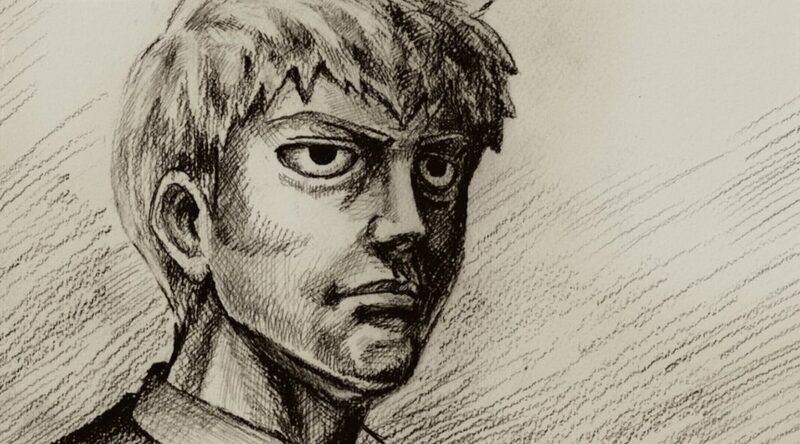 Reigen on the other hand is linked to these poor excuses of Dezaki Postcards, detailed yet ridiculous drawings that pop up whenever he uses his non-techniques or attempts to be perceived as serious. 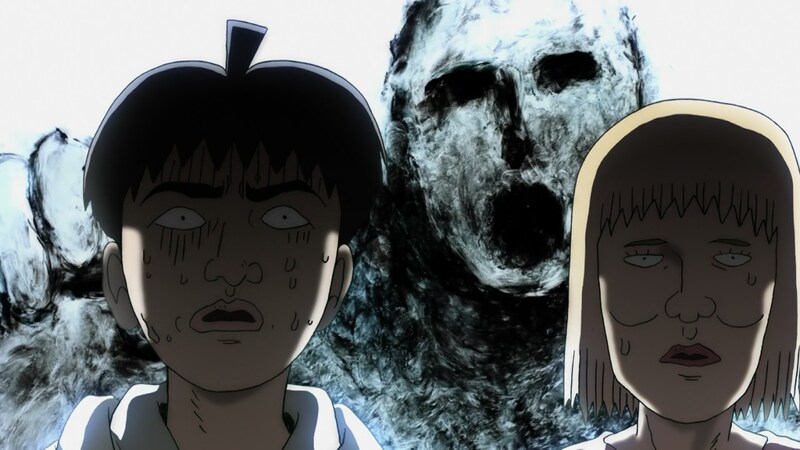 Sometimes there’s a clear intent to mirror the solemnity and sense of gravitas of Sato’s sequences, but it’s clearly not the same thing – Reigen is a farce after all. And it’s not just Tachikawa who has such a solid grasp on how to sell Reigen’s character! 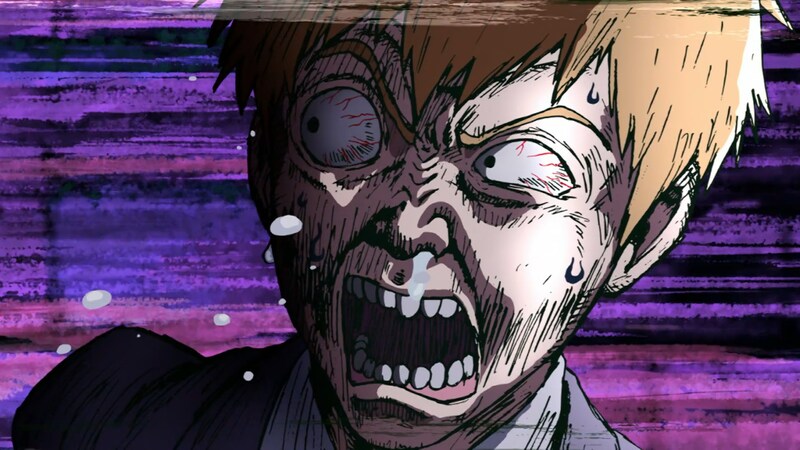 This applies to Yoshimichi Kameda as well, the person who had the most control – despite not being Chief Animation Director per se – over his motion; it’s not by accident that Reigen constantly warped into smears under his pencil, that’s a key part of his demeanor. His body language has way more flourish than it needs, it’s a constant barrage of overdone movements that are best represented with limb multiples. 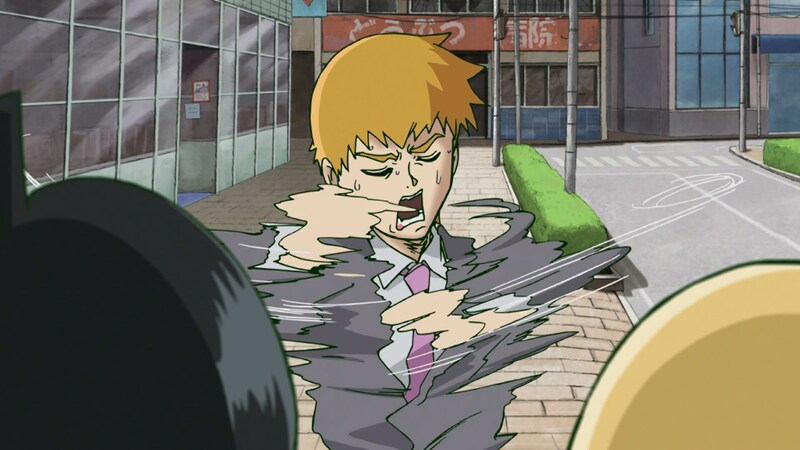 He gesticulates more than anyone else, and even the timing of his animation is wilder; especially when his lack of patience leads to a short outburst, Reigen’s acting becomes noticeably brusque. Only Dimple, a notorious narcissistic liar himself, shares this kind of abrupt sequences. It’s no coincidence. His charismatic – albeit not necessarily in the way he would like to be – persona made all his appearances very amusing, but it wasn’t until the final arc where Reigen truly got to shine, as he stumbled into the enemy’s headquarters in a combination of baseless confidence and luck that is very much like him. While he was always a parental figure of sorts for Mob, it’s around the end where he’s established as his unlikely moral compass. 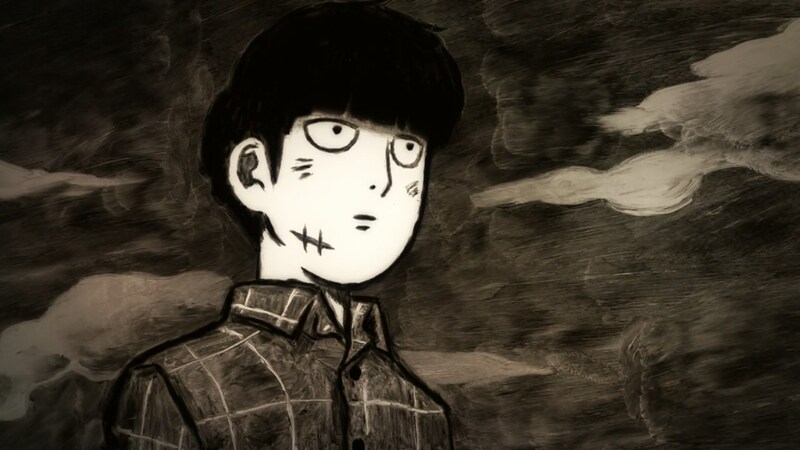 He’s no angel himself, but he’s the person behind the one principle keeping Mob’s life relatively stable: be a good person, and don’t hurt other people. 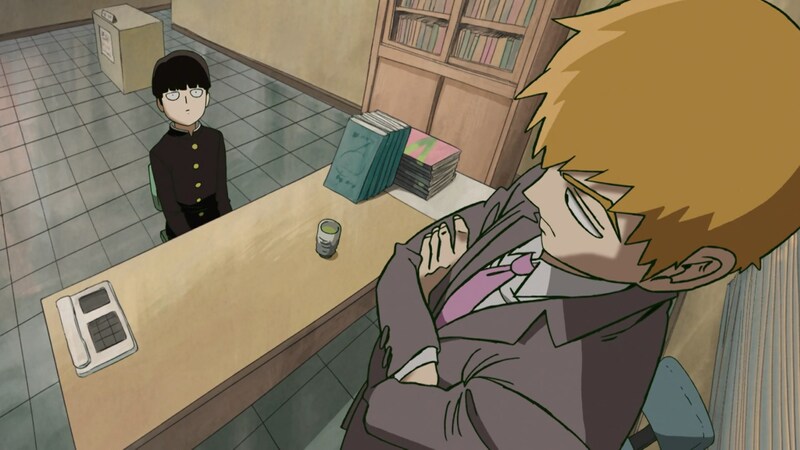 That simple rule is not a perfect answer to Mob’s dilemmas, particularly in a world with people set to hurt him, but Reigen convinced him that kindness is still worth it. The final confrontation is appropriately not a case of Mob letting loose his terrifying powers then, but rather believing in his master’s words. 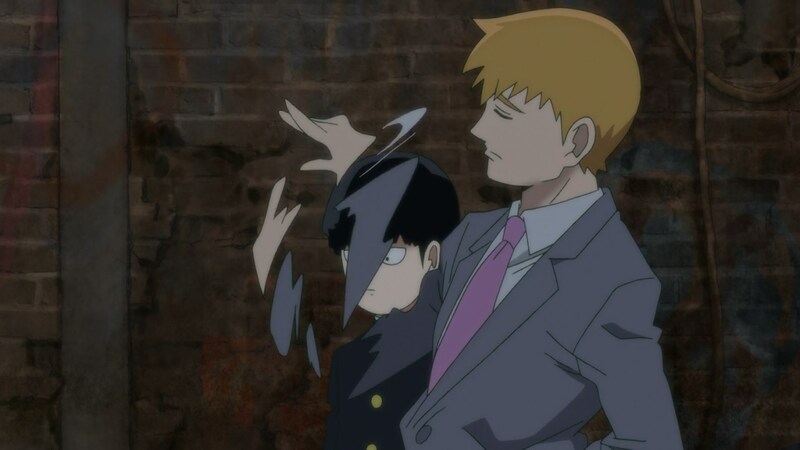 The moment Reigen realizes Mob’s blind admiration – and psychic energy, more importantly – are flowing onto him, he can’t help but show off and ridicule his opponents. His previously unfounded confidence is backed by incredible power now, and he seems to spend a lot more effort looking cool than actually neutralizing their enemies – a stark contrast with the way his pupil fights. 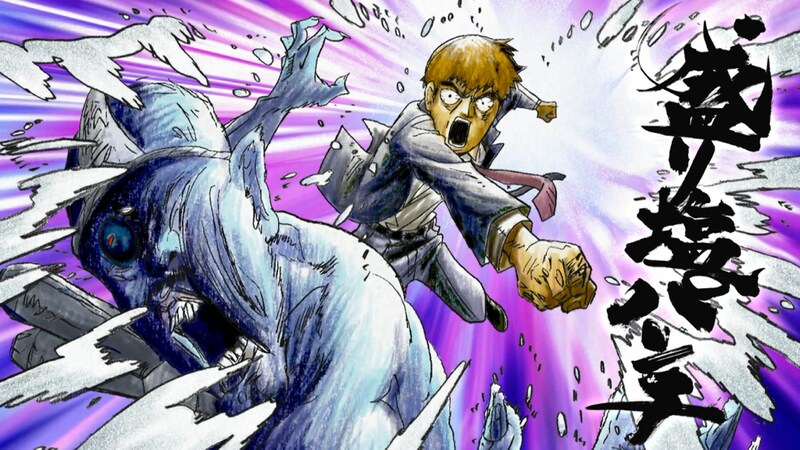 Character and camera seem to momentarily fuse, as Reigen’s action is framed in the coolest way possible, and the animation makes sure to show he isn’t even trying. The organization they’re facing is full of overgrown brats who saw the world was harsh, then shielded themselves behind their psychic abilities and told themselves they’re special beings who should operate under different rules. 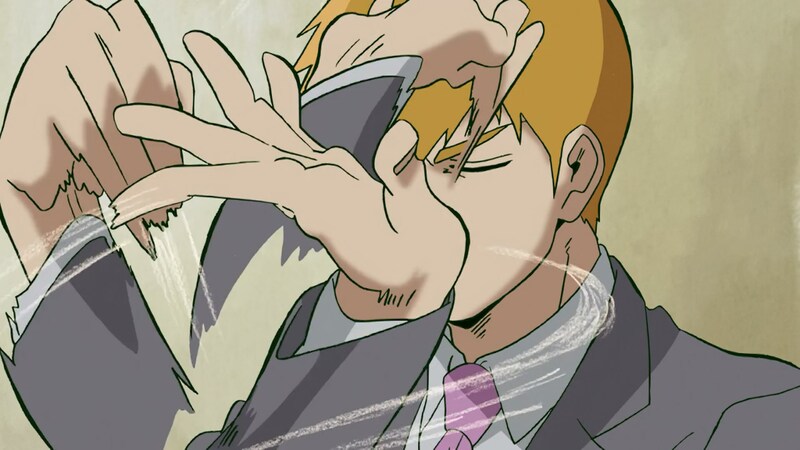 After defeating them with ease, Reigen admonishes their childish attitude…in the least adult way possible. He practically yells at them to grow up, once again losing his patience and gesticulating like mad; Kameda clearly had a blast correcting his outbursts, richer in deformations and exaggeration than ever. 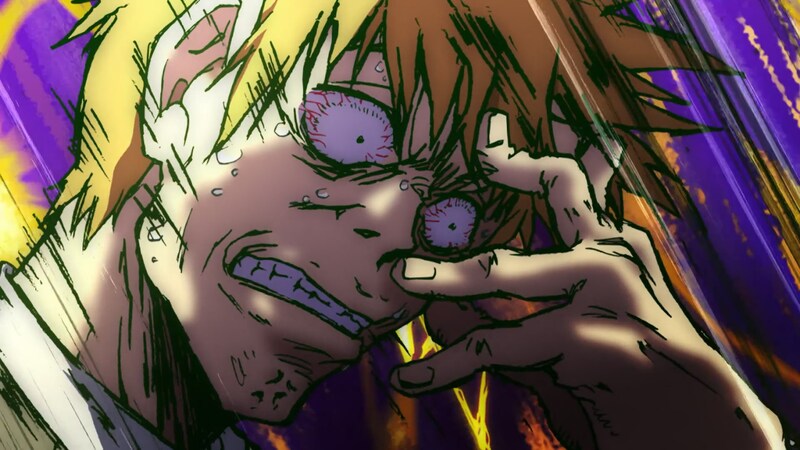 Reigen is Reigen after all, a fascinating mess of a nice (?) person. 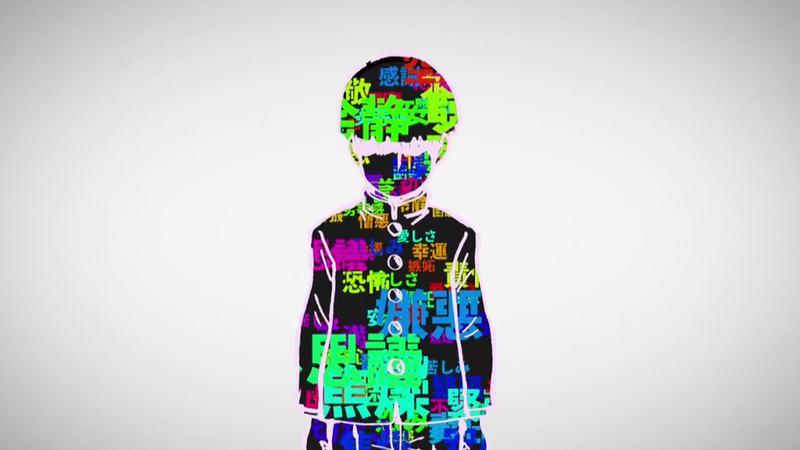 The atomization of anime’s execution into separate and seemingly unconnected aspects may be useful, but series as complete as Mob Psycho 100 blur the lines to a degree that makes it pointless. 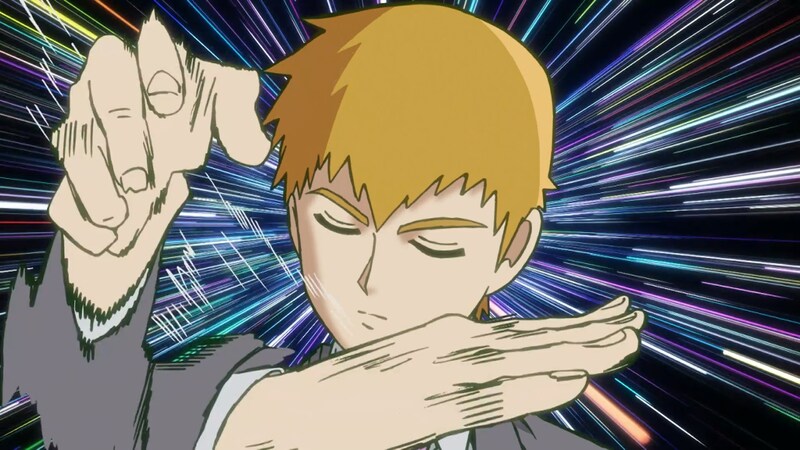 Reigen’s character is built by how he’s portrayed as much as by what he says, and isolating ‘animation’ then claiming that it’s simply a tool aiding ‘writing’ seems entirely misguided; it’s his words, his movements, the way he perceives the world and himself, and his effect on other people are what constitutes the lovable farce that is Reigen. 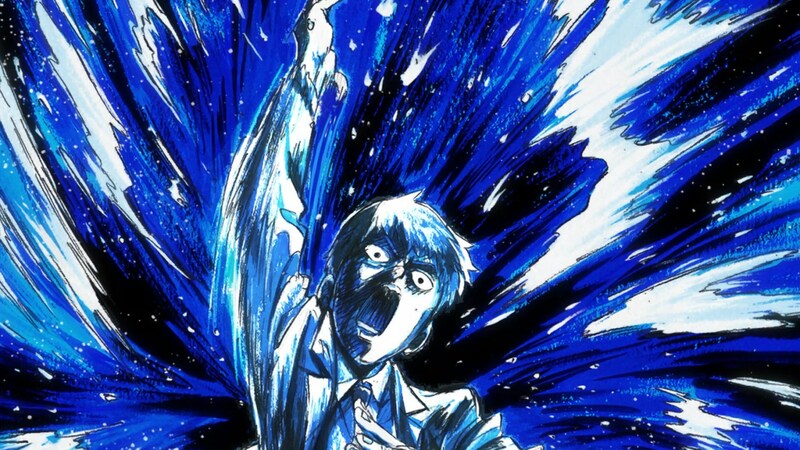 And that’s the Mob Psycho 100 coverage on the site… for now! We might prepare a fun surprise for you later down the line, and of course we would love to write about it again if it’s lucky enough to land a sequel. Nicely put. 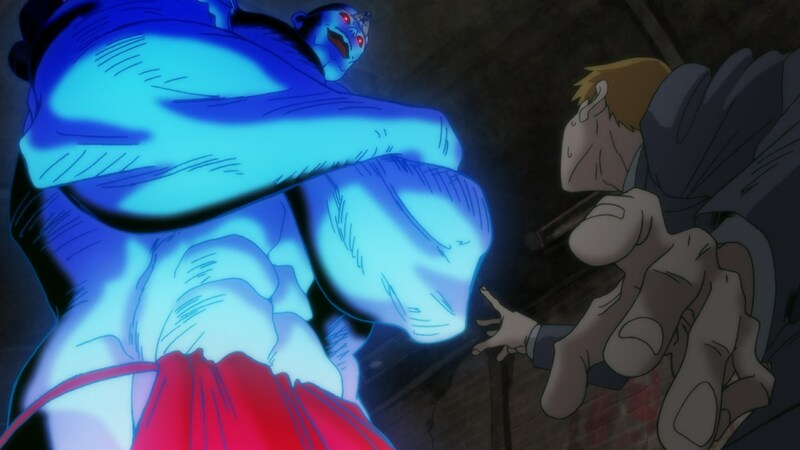 Mob Psycho really feels like a perfect opportunity to share with people how animation, itself, can often be the driving force of a narrative, rather than simply a tool to tell the story. Or some kind of “bonus”. Great article. I miss this season so much already. You don’t get this sort of wild and loose virtuoso animation as the dominant look of a show.